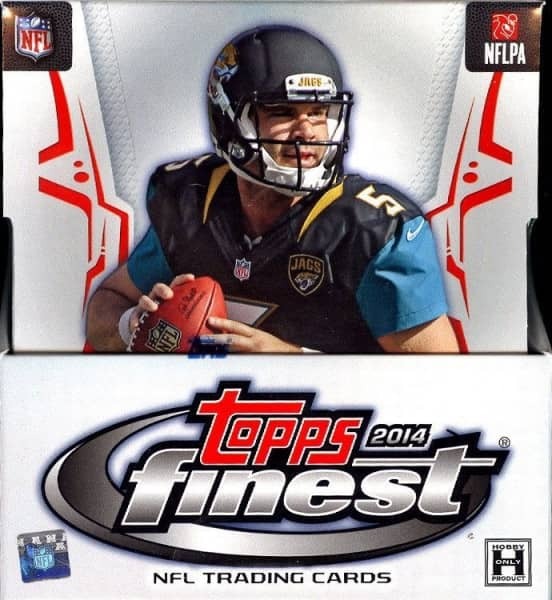 Factory Sealed 2014 Topps Finest Football Hobby Box mit 2 Mini-Boxen Per Box, 6 Packs Per Mini-Box, 5 Cards Per Pack. - 2 Fantasy's Finest Cards NEW! Produktinformationen "2014 Topps Finest Football Hobby Box NFL"
- Pulsar Refractor Parallel: Jumbo Patch #'d to 25 NEW! - Blue Refractor Parallel: Seq #'d to 99. - Red Refractor Parallel: Seq #'d to 75. - Gold Refractor Parallel: Seq #'d to 50. - Pulsar Refractor PATCH Parallel: Seq #'d to 25. NEW! - Black Refractor Swoosh Parallel: Seq #'d 1/1. - Pulsar Refractor Parallel: Seq #'d to 10. NEW! - SuperFractor Parallel: Seq #'d 1/1. NEW! - Blue Refractor Parallel: Seq #'d to 25. - Red Refractor Parallel: Seq #'d to 15. - Pulsar Refractor Parallel: Seq #'d to 5. NEW! - SuperFractor Parallel: Seq #'d 1/1. - Red Refractor: #'d to 25. - Pulsar Refractor: #'d to 10. NEW! - Pulsar Refractor Parallel - #'d to 99 NEW! - Gold Refractor Parallel: Seq #'d to 75. - Red Refractor Parallel: Seq #'d to 50. - Pulsar Refractor Parallel: Seq #'d to 25. NEW! - BCA Refractor Parallel: Seq #'d to 10. - STS Refractor Parallel: Seq #'d to 10. - Printing Plates: Seq #'d 1/1. Weiterführende Links zu "2014 Topps Finest Football Hobby Box NFL"
Fanbewertungen für "2014 Topps Finest Football Hobby Box NFL"